To make creamy cucumber sauce, in medium bowl, beat cream cheese with spoon until creamy. Stir in remaining sauce ingredients. Cover; refrigerate until chilled, about 2 hours. Cut steak and chicken across grain into 1x1/2-inch pieces. Blot dry with paper towels; arrange on lettuce-lined platter. Cover; refrigerate until serving time. Arrange vegetables on separate platter; set aside. 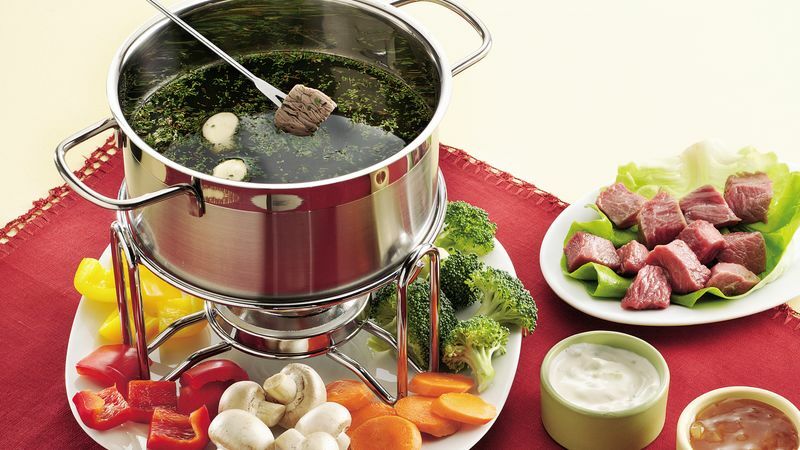 At serving time, divide broth between two 3-quart electric fondue pots; add half of garlic, parsley, thyme, salt and the pepper to each fondue pot. Heat at 375°F until boiling. With long-handled fondue forks, spear meats and vegetables; place in hot broth. Cook 2 to 4 minutes, keeping broth at a low boil, until beef and vegetables are desired doneness and chicken is no longer pink in center. (Because fondue forks become very hot, transfer meat and vegetables to plate and use table fork for eating.) Serve with sauces for dipping. A lettuce-lined platter serves as an attractive way to serve the raw chicken and beef. Discard the lettuce leaves when the meal is over.